Different types of stirrups are designed for columns based on their varying cross-sections, the number of longitudinal reinforcement bars and the load carrying capacity. Stirrups in column construction are commonly known as vertical ties or transverse reinforcement. A brief description of different types of stirrups are stated below. The helical reinforcement differs from the lateral ties as the latter one possess spacing between individual ties. 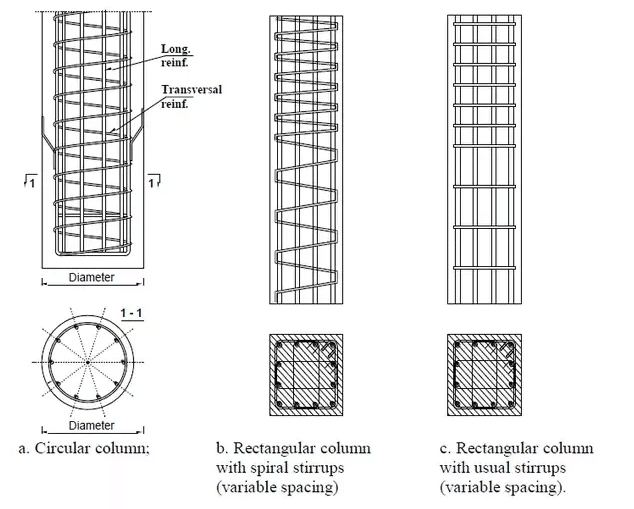 In helical reinforcement ,instead of spacing, the measured value is pitch as shown in the figure-1 below. Compared with lateral ties, the helical reinforcement provides more ductility and flexibility to the column constructed. They also provide more efficiency to support the longitudinal reinforcement. The buckling resistance of the column structure is improved by the use of helical reinforcement. The helical reinforcement can also be used as spiral reinforcement. Helical bars are mainly recommended for seismic design. Under the action of seismic loads, the concrete that is attached to the helical reinforcement is initially peeled off. This helps to provide a warning sign about the structural condition of the column. The helical reinforcement is a good choice in terms of uniformly distributing loads when compared to the normal rings (lateral ties). The lateral ties are transverse reinforcement which forms an individual ring with a fixed spacing between each the links (figure-1(c)). The lateral stirrups provided can be two-legged stirrups, four-legged stirrups or six-legged stirrups etc depending on the column cross-section and the number of vertical or longitudinal reinforcement bars employed. 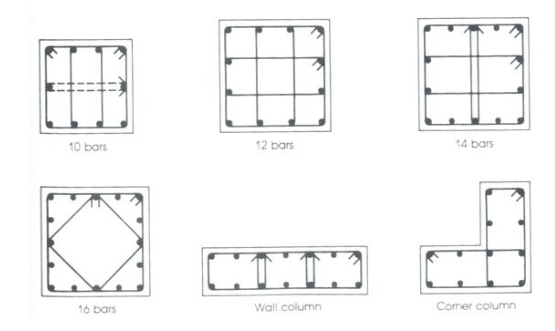 Here different Lateral tie configuration for different number of vertical reinforcement bars are explained. The configurations are based on the ACI 315-99 recommendations. The figure-1 below shows the tie configuration for 4 numbers of vertical column bars. This is a typical type of configuration employed for simple column design. This configuration can be called as 2 legged stirrups column type. The first arrangement in figure-3 above is followed when the spacing of vertical bars are less than 150mm ( Less than 6”). When The spacing is greater than 150mm, the second arrangement is followed where crossties are employed. The first arrangement above shows the typical 8 number vertical reinforcement arrangement. Here the spacing will be less than 6”. When the spacing is greater than 150mm two crossties are used as shown in the second arrangement (figure-4). The third arrangement is called bundled bars arrangement. Here two bars are bundled at the corners.No cross ties are hence employed. The maximum number of bars that can be bundled are 4. In this case, it is necessary to have cross-ties other than the square ties. This can also be arranged in bundled bars as shown in the second arrangement( figure-4). Here bundle of 2 bars is placed at four corners and two remaining bars are supported with the help of cross ties. Among the arrangements shown in figure-5, the arrangement for 16 bars makes use of diamond ties. Diamond ties are very difficult to accurately fabricate, so it is avoided. It is also difficult to place and align them properly. This tie arrangement is not recommended by ACI 315 due to the difficulties associated with it. But some country standards employ this arrangement for simple column design. Fig.6.Lateral Tie Arrangement for 16 bars with cross ties. A 16 bars column arrangement as per ACI 315 is shown above. Here bundled bars can. For 16 bars, 4 bundled bars can be provided at each corner.